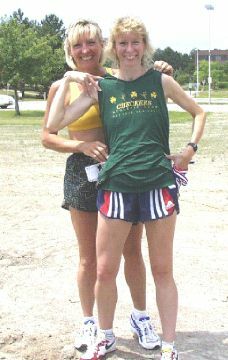 Rochester, NY (1999) - Sue Devlin, representing the Greater Buffalo Track Club (GBTC), single-handedly defeated every track team in the Niagara District to post an amazing "team" victory in the annual Niagara District USATF Track and Field track meet held Sunday June 20 at the Rochester Institute of Technology. After last year's meet, Sue had been on the receiving end of harsh words, from her own teammates, as a consequence of a story published in the Buffalo News that stated that the "Checkers Women Beat the GBTC Women in Track". At least one club member felt that somehow Sue, running all alone in the meet, "had let the team down". 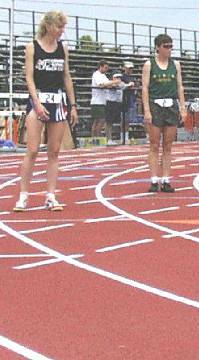 All Sue had done was score a stunning upset victory while earning gold and silver medals in her first track meet. GBTC did not send a team to that meet one year ago. Club members were understandably miffed last year when they read about the defeat they had allegedly suffered. GBTC did not send a team to this year's meet either, but amazingly won the women's team title! It did so thanks to the efforts of a 39 year old mother of two. Sue somehow found the courage to come back, a year later, and run her second track meet even after suffering the brunt of the honest journalistic miscue that must have been painful for her. Sue's plan to atone for last year's errant Beebe story was so audacious that she shared it with almost nobody. The first clue to her strategy was revealed shortly after the meet began. "Your attention please!" blared the meet's public address system. "The winner in the women's open long jump is Sue Devlin of the Greater Buffalo Track Club". Then only moments later... "Your attention please, the winner of the gold medal in the women's open javelin throw is Sue Devlin of the Greater Buffalo Track Club". She was doing it! Next Sue proved that her victory in the 1500 meters the previous year was no fluke as she once again defeated the Checkers President, Diane Sardes, and won the gold medal again, convincingly. Sue was like a tornado running back and forth between the field and the track entering as many events as she could. "We haven't seen that kind of energy and enthusiasm for years! It's refreshing" remarked Bill Quinlisk, the meet's director. "You don't see that every day", remarked USATF official Perry Jenkins as he watched Sue adjust her starting blocks. "A distance runner doing the sprints!" Jenkins mused. Sue had never run a sprint before in her life, but she surprised and delighted the track fans as she sped to a silver medal in both the 100 and 200 meters events. Sue rounded out her scoring by repeating her silver medal performance of a year earlier, once again finishing behind Checkers' remarkable Becky Heuer. For her efforts, Sue was awarded the women's team trophy for single-handedly winning the 1999 Niagara District Track and Field Women's Open Team Championship. Nice job Sue! For the record, you did not let the team down. See part 1 to this story: Beebe Bamboozled!